From Steph in Shanghai to crazy fans in Philadelphia, SI's Rick Reilly dishes outtakes from his reporting on the Golden State Warriors. 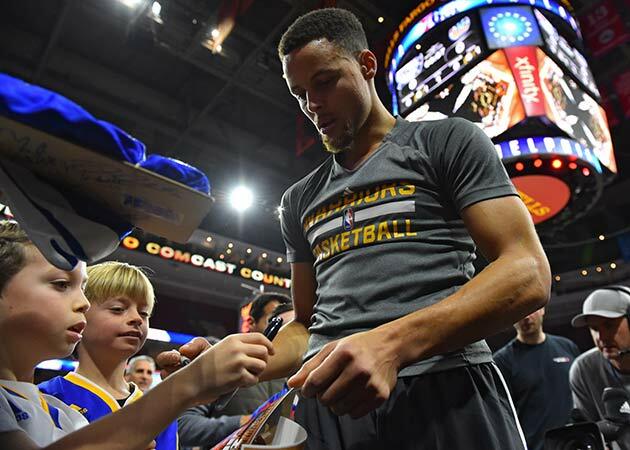 Editor's note: Rick Reilly went on the road with Stephen Curry and the Warriors for his cover story in last week's Sports Illustrated. All of his reporting, however, couldn't fit into the pages of SI. Here are some leftover nuggets from his notebook and outtakes from his interviews with the Warriors. It’s February and you can’t swing a dead goat at a Warriors game without hitting a celebrity. It’s like the old Mystery Date game: Who’s going to be waiting on the other side of the door after the game? 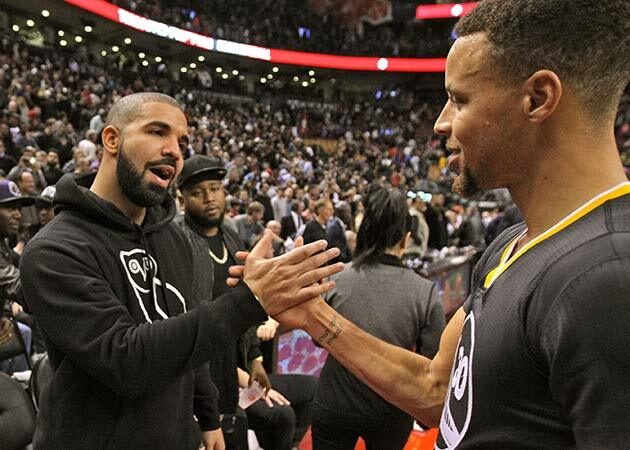 In Toronto, it was Drake. In Milwaukee, Aaron Rodgers. In D.C., Alex Ovechkin and Desean Jackson. In Oakland, the famous names line up like it’s a DMV: Vin Diesel, Manny Pacquaio, Dave Chappelle and countless others. When Curry hurt his shins a few weeks ago, Lionel Messi himself sent shin guards. At the Thunder game, Beyonce, Jay Z, Kendrick Lamar, Kate Hudson, Terrell Owens, Jim Harbaugh and a few dozen other celebs bought seats. Nobody got in free, the Warriors ticket staff says. Plenty celebrities got turned away. The Warriors are new to being the One Direction of the NBA, so they don’t save seats for celebrities. Besides, their celebrities—Google, Oracle and Uber execs—are richer than your team’s celebrities, by a limo full of hedge funds. No chance. Only one ticket went unused against the Thunder. It’s hilarious that Oscar Robertson thinks that, somehow, NBA teams haven’t thought of trying to stop Curry. Does he have League Pass? 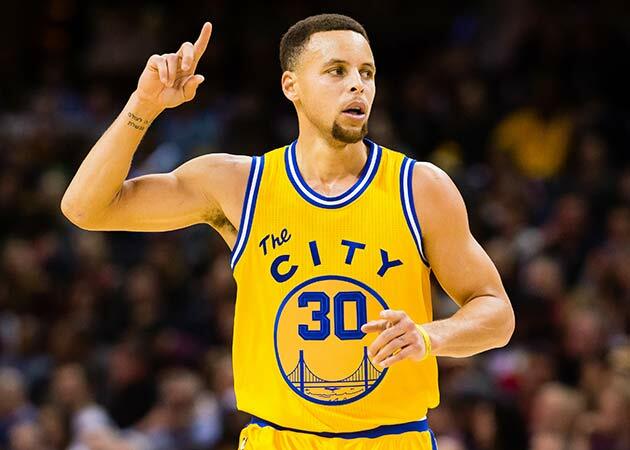 Entire teams are geared toward stopping Curry. He is constantly doubled, almost never gets a wide-open three unless he creates it himself, and gets guarded by guys who aren’t even playing. It’s wish-you-were-anywhere-else degrees in Philly as Curry steps off the bus and into a secured parking lot at the Wells Fargo Center for a nighttime shootaround after a long flight. As he’s heading for the players-only entrance with the rest of his teammates, two things suddenly drop from the sky and hang right in front of his face. The items: one of his Sports Illustrated covers and one of his jerseys, both attached to clipboards, which hang down from white ropes. Curry looks up and sees a father and a son, 30 feet above him, standing at a railing, dangling the lure and looking longingly, pleadingly, achingly at him. “Steph? Sign? Please?” the dad hollers. Imagine that. Fishing for Curry. 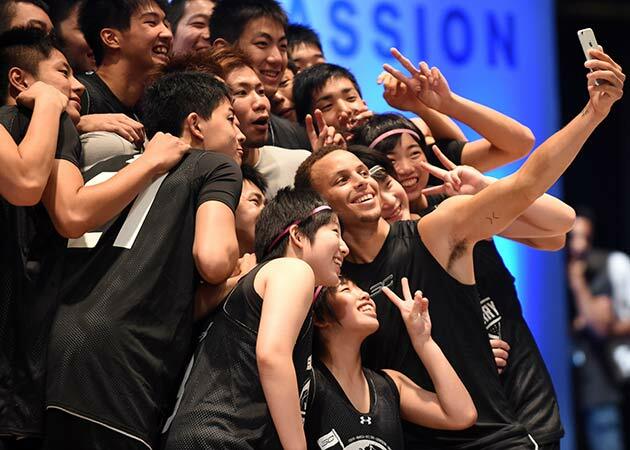 Naturally, Curry signs and they start reeling in their prize, delighted. But Curry doesn’t leave. He takes out his phone and films them as they pull in the catch. “Never seen that before,” he says. But the deal includes a breakneck Asian tour every year and it’s not easy. It’s not an act. You don’t know a couple more in love than Steph and Ayesha Curry. Plus, he’s rather infatuated with his two kids, Riley (3) and Ryan (infant). He’s one of these annoying dads who never stops with the kid videos on his phone. And right now, he’s missing them. Somebody nudges him. He looks up. In the mezzanine, somebody is waving—on a 10-foot pole—a giant Riley Curry head.